An Indianapolis woman charged with killing her premature baby by ingesting rat poison while she was pregnant is asking the Indiana Court of Appeals to throw out murder and feticide charges against her. Short of that, Chinese immigrant Bei Bei Shuai (BAY BAY SHWAY) is asking the court to allow her release on bond. Shuai's attorney says she ate rat poison because she intended to kill herself, not her baby. Many of my friends who support unlimited abortion rights up until nine months of pregnancy, base their position on a woman's right to control her own body up until the moment the fetus changes residence by leaving the womb. Pursuing feticide/murder charges against a Bei Bei Shuai for harming the fetus growing inside her body contradicts that position. But instead of looking what the law should or should not be, let's look at what it is. Shuai was approximately 8 months pregnant and the child was presumably viable. Indiana law does not allow someone to have an abortion that late in her term. 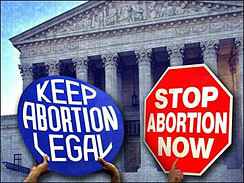 However, because of the Supreme Court case Doe v. Bolton, a companion case to the better known 1973 case Roe v. Wade, even Indiana law must allow abortion during the last trimester if needed for the health of the mother. Per Doe v. Bolton and progeny, this health exception includes mental health. Shuai could have gotten an abortion even in Indiana and in many states, like New York, she could have gotten an abortion up until 9 months without even claiming a health exception. At what point does fetal life deserves protection? Is it at conception or is it at the moment the child emerges from the uterus 9 months later? Most likely the state legislatures in this country would have drawn a line somewhere in between the two extremes, brokering compromises as to the very legitimate issues represented by both sides of the abortion debate. Unfortunately Roe v. Wade derailed that public debate and made the abortion debate a fresh wound that remains no closer to healing than it was nearly 39 years ago. I don't see how this "exposes intellectual contradiction of abortion on demand crowd." Seems more like it exposes the inconsistency of abortion opponents and the state. How many abortion opponents, who believe that any intentional termination is murder, argue that all women who abort should be prosecuted for murder? Very few. They want the abortionists prosecuted, but not the mothers. They take that position because they know that anti-abortion support would plummet if women were prosecuted. The woman and her attorney are arguing that she should not be charged with murder, but you offer no evidence of what the pro-choice advocates propose in her case. The inconsistency in her case seems to be on the part of the government, not ideologues on either side. Neither of the two most vocal sides in the abortion debate are morally or intellectually consistent. Some influential libertarians offer a different and thoroughly consistent approach, based on property rights. In this law journal article, Block and Whitehead lay out that approach in detail. Well, I think there is going to be intellectual inconsistency regardless of how the debate is decided. Legislative compromises would have been much better for this country than an invented judicial approach to the issue. My point is that there are a number of pro-choice advocates who want abortion on demand because it's the woman body, yet have no problem with this woman being prosecuted. There are, however, pro-choice people out there though who recognize the intellectual inconsistency and want the prosecution dropped. I at least give them credit for their consistency. The "compromise" a majority, if not most, states would choose would be to outlaw abortion entirely, prosecute any physicians who perform abortions, and imprison the would-be mothers. One aspect of Roe v. Wade was the drop in crime that began in 1991. That was the year when fetuses aborted in 1973 would have turned 18, the prime age for males to engage in crime. The study was conducted by professors from UChicago and Stanford. They had no political stance on choice when they started. The claim that legal abortion led to reduced crime is, to say the least, highly controversial. What happened to the link I provided in the my first post?